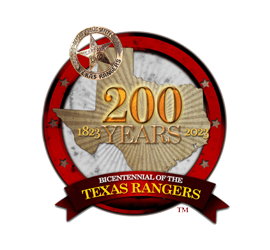 The Texas Ranger Hall of Fame in Waco is proud to be the official steward of the 2023 Texas Ranger Bicentennial™. The State Texas Public Safety Commission has tasked us with developing and coordinating the anniversary of America’s oldest statewide public safety organization—the Texas Rangers. The Texas Rangers have been a popular subject for authors and publishers since the 1840s. More than 3,000 titles are currently listed as in-print on Amazon. We anticipate that many new titles, as well as reprints of classics, will soon appear. We have created a program for academic and commercial publishers to encourage, recognize and market quality nonfiction publications about the Texas Rangers. There are no fees for participation in the program; it is intended solely to encourage and recognize work adding to the knowledge and appreciation of Texas Ranger history. In conjunction with the anniversary, the State of Texas has trademarked an official Texas Ranger Bicentennial™ seal to be awarded to accepted publications. Publicity through the Texas Ranger Hall of Fame upon release, and inclusion in the list of Texas Ranger Bicentennial™ publications on the official website. Nonfiction works of significant relevance to the history and material culture of the Texas Rangers published by established academic or commercial presses from January 2016 through December 2023. Publishers may submit later printings of books first published after January 2016 and reprints of 'classics' published from c.1840 to c.1950. Juvenile literature (children and young adult) based on accurate history or depiction suited to school and public library collections. Works issued solely in electronic form without a print edition. A readable narrative style appealing to a general audience, or, a reference compilation of biographical sketches, data or material culture information. Please Note: Application must be made by the Publisher, not the Author. Only works with a publication commitment are eligible for consideration. There are no fees or charges associated with the program. Acceptance is a designation of merit in conjunction with the anniversary. Publishers are expected to actively promote accepted publications in conjunction with the Texas Ranger Bicentennial™. Please send a letter of request from the publisher as an email attachment (info@texasranger.org), or by post, to Director, Texas Ranger Hall of Fame, Waco, TX 76706-2570. Please state that the work has been accepted for publication and the expected date of release. Please include, marked with copyright statement, either (a) a confidential copy of the manuscript, or, (2) the table of contents and two selected chapters. Reprints of “classics” need only submit any new foreword, notes or addenda. The review process will be expedited to facilitate your publication schedules. Works are reviewed solely to determine that they meet the criteria stated above for the program. The pool of reviewers are drawn from published scholars in Texas Ranger history, Texas Rangers and the Texas Ranger Hall of Fame and Museum professional staff. (1) The permanent collection of the Tobin and Anne Armstrong Texas Ranger Research Center, the official State repository of the Texas Rangers. (2) The Headquarters library of the Texas Rangers / Texas Department of Public Safety in Austin, Texas.